[ABRAHAM LINCOLN ASSASSINATION]. Ferrotype mourning badge. April-June 1865. A ½-inch circular ferrotype image of Lincoln, with “A. 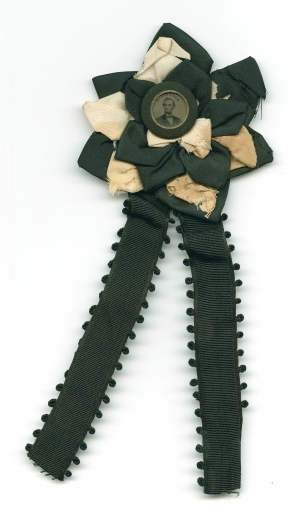 Lincoln” printed above, covered in black cloth, backed by a black-and-white silk mourning rosette with a pair of black ribbons below. 3 x 7 in. An exceptional example. The assassination of Abraham Lincoln on April 14, 1865, shocked the nation and the world. Killed in a theatre on Good Friday, on the heels of the fall of the Confederate capital and the surrender of Robert E. Lee’s Army of Northern Virginia, the first assassination of an American president instantly turned joy in the northern states and among freed people in the South into mourning. Even those who opposed Lincoln politically were shocked by the act and the related near-fatal attack on Secretary of State William H. Seward. White southerners, fearing a more vindictive North led by President Andrew Johnson, also mourned publicly, though many privately rejoiced.